The first half of the year was very exciting for oil investors. But what can we expect for the rest of 2018? There was a lot of hope surrounding commodities going into the year. 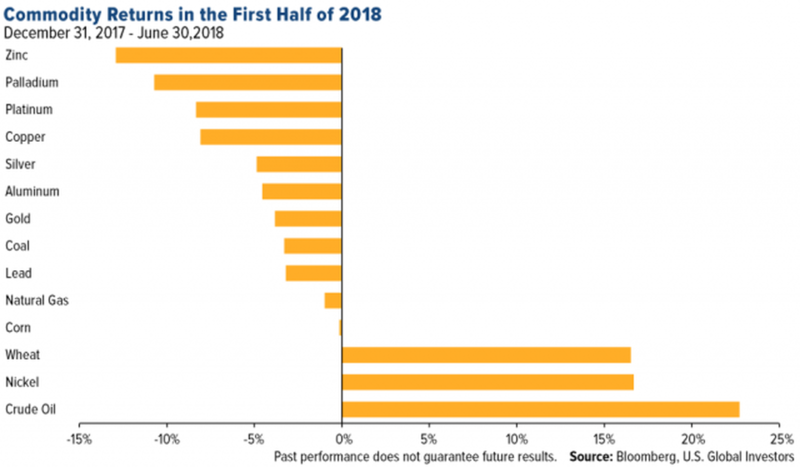 But prices largely fell short of expectations during 1H 2018. That was despite increasing U.S. inflation, rising global debt levels, and growing geopolitical tensions. Crude oil, however, was an exception. Of the 14 commodities tracked by U.S. Global Investors, only three saw gains in the first half, led by oil. Stimulated by an OPEC agreement to cut global crude supplies, oil prices have steadily been on the rise since 2016, when they bottomed around $30 per barrel. Back in May, an IEA report showed world oil inventories were at a three-year low. A few weeks prior, the U.S. Energy Information Administration published a report describing American crude stocks also at their lowest levels since 2015. All this helped push the price of crude to nearly $80 per barrel. You probably remember gasoline prices shooting up quickly in the spring. This was a large part of it. Oil inventories here in the U.S. and abroad have since increased from these lows. And crude prices have subsided, along with gasoline prices a bit. At last look, NYMEX crude oil spot is trading at $66.86 per barrel. But more unexpected supply cuts could again dig into crude stocks and bolster prices for the remainder of the year. Several weeks ago, an unexpected power outage in Canada removed about 350,000 barrels per day from a large oil sands site. Meanwhile, conflict in Libya led to disruptions at crude oil export and storage facilities. But the big unplanned outage story during the first half of 2018 was Venezuela. Of all the factors supporting oil prices right now, geopolitical contention may have the most immediate and noticeable effect. For short-term trading, SPDR S&P Oil & Gas Explore & Production ETF (NYSE: XOP) is a great option. For direct exposure to crude, United States Oil Fund ETF (NYSE: USO) is a good trading tool. Oil is dying. But it's not dead. Despite the rise of electric vehicles, the global oil demand is expected to continue increasing through the next decade for sure. There is still time to make plenty of money. Stay long oil for now. Our founder, Brian Hicks, swore he would never touch a pot stock. Never! That was until he was shown a little-known way to collect regular dividend checks from a pot company so safe and consistent that he immediately bought 12,000 shares. It’s the only pot stock of its kind, with virtually no competition. With a 100% market share, it's no wonder this pot stock company is up 89% in the last six months. Find out why he is raving about this particular stock... even calling it “the only pot stock I’ll ever own.” Click here. Venezuela is falling apart. Over the past several months, President Nicolás Maduro’s socialist regime has been struggling with uncontrollable inflation, violent protests, and political instability. And now an assassination attempt on the president has put the country closer than ever to total collapse.